Sydney Allen was born in Thame and baptised at St Mary’s Church on 25th March 1888. He was the son of Richard and Ann Allen (nee Alder) of Thame, and had eight siblings, including his brother Charles who also fell during the war. The family lived at 45 High Street, next to the Six Bells. In 1911, Sydney was a printing compositor, living with his brother Edwin and his wife in Greenwich, London. Sydney married Laura Adelaide Fryatt in 1912 in Greenwich, and went on to live in St Asaph Road in Brockley, SE London. Sydney was called up in 1916 when the Military Service Act was extended to married men. He was enlisted in Camberwell, Surrey, and posted to the Northumberland Fusiliers. Initially he was with the 1/4th Battalion before being transferred to the 1/5th Battalion, both battalions serving with the 149th Brigade of the 50th (Northumberland) Division. Having recovered and returned to the battalion, which was now in France, he was placed in V Platoon of C Company. Sydney was posted as missing in action on the 28th March 1918 during the Battle of Rosières, part of the German spring offensive through the Somme area. 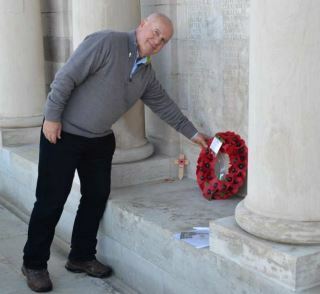 263029 Private Sydney Allen has no known grave and is commemorated on the Pozieres War Memorial, Somme, France. His is remembered in Thame on the war memorial and on the memorial boards of St Mary’s church and All Saints church.